Entertaining guests and spending quality time with family are good reasons to enjoy the outdoors especially if you have fire pits and fireplaces installed. Aside from the aesthetics these fire features provide, there are many other benefits of having one installed in your backyard. Our design team consists of experienced professionals who can help you in creating new design ideas for your fireplaces. We will also help you determine whether a pre-built or custom fireplace would best suit your area. 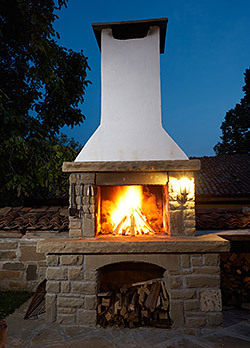 At Outdoor Escapes, we value our client’s satisfaction so we make sure that each fireplace built or installed are safe, functional, and elegant. We offer a wide range of materials to choose from –bricks, stones, concrete, and other premium materials. We know that fireplaces can be a fire hazard so we also provide additional features and amenities like specialized screens. These are designed to keep people, especially kids, from getting exposed to heat and sparks. Just like our fireplaces, our fire pits are designed and built using premium materials to ensure they will last a lifetime. You are assured that they are functional and beautiful because of the creativity and excellent workmanship of our people. It is easy for people to gather around it so it makes the area perfect for small gatherings and great family bonding moments. It is easier and quicker to install. It can be a portable version of a fireplace, so you can move it from one spot to another with ease. It works in small spaces or tight outdoor areas and can be positioned in almost any spot in your outdoor space. It comes in a variety of shapes, sizes, and colors to match your personal style or the current theme of your home. Aside from the design and installation of fire pits, we also provide screens, covers, and other accessories to make them more functional and safer to use. 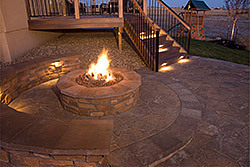 We understand that property owners want a reliable contractor for fire pits and fireplaces installation. This is one reason why we always strive hard to make sure every client gets satisfying results. 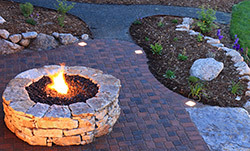 Whether you are in Lee’s Summit, Raymore, Blue Springs, or just about anywhere in Missouri and Kansas, we will provide you with a variety of options when it comes to choosing the right type of fire pits and fireplaces for your property. We will help you in the conceptualization phase and we will incorporate your ideas in the final design of the fire feature. Our team follows a systematic installation process to ensure that the project will be completed on time and within budget. You may also choose to have custom-built fire features with the help of our design team or you could opt for our pre-built designs for faster installation. Our partnership with Belgard, the leading landscape product supplier in the country, is also our assurance that you will get quality fire feature products. If you have other questions about our design and installation of fire pits and fireplaces, just give us a call. We also offer free estimates to our Missouri and Kansas clients.